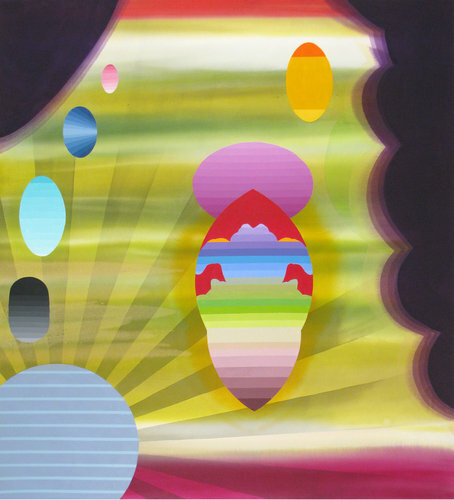 Stephen Mueller, “Roland,” 2010, acrylic on canvas. Courtesy of Lennon Weinberg. According to Roberta Smith in the NYTimes, Stephen Mueller, 63, died on Sept. 16 in Manhattan. His sister Debra Pendleton has said the cause was lung cancer. “Mr. Mueller’s mature paintings, which took shape in the early 1990s, were cross-cultural hybrids that presaged many current concerns in abstract painting, most importantly its scant interest inbeing purely abstract.” Smith writes in the obituary. “Mixing motifs distilled from tantric art, Indian and Persian miniatures, and Mexican ceramics and cartoons, his paintings combined a dizzying array of references and allusions with striking formal contrasts and a brilliant palette. It all might have been overwhelming except for the care with which he constructed his compositions, spatially and chromatically.” Read more. Read Mueller’s writing at ArtCritical. Read ArtCritical Editor David Cohen’s tribute to Mueller.